It’s amazing how children have an innate ability to believe. Not just in figures of authority (mum, dad, tall people wearing high viz Binge Culture vests) but in the very reality that they have willingly participated to act out their own particular role in a constructed reality. And of course, the adults often follow suit. At least that’s what happened at Auckland CBD tonight when multiple whale pods crooned, wailed and gurgled their way across Aotea square as they splayed their corrugated polycarbonate fins high in the evening sunshine. The music was spot-on (was it Free Willy?) and the elegant bodies of these aquatic mammals (fifteen agile and committed volunteers dressed in wetsuits) swam around the urban landscape. However, as the more adventurous ones meandered down Queen Street, one lonely whale finds himself on his own. Eventually and perhaps from the on-going attention of the growing crowd, he needs a rest and find himself ‘beached’ on the hard concrete outside the Town Hall. And as expected, his compatriots are quick to swim to his rescue. But then what happens is the sad and unfortunate truth; the entire pod gets stranded and when backup arrives, well, let’s just says they don’t quite come with a suitable plan B. But what does happen is that the crowd at Aotea Square (some who have clearly come prepared with towels, buckets and even water guns) rally around the leaders in high viz and follow instructions to look after the whales. It is quite uplifting to see strangers come together (even if for some it seems more like an opportunity to dump a bucket of water on an unsuspecting whale’s head) and collectively support and comfort the whales. If there are instructions not to tip water into the whales’ blowholes (a very real piece of advice) I might have missed hearing it but I also don’t see where exactly it is on my whale’s head either. After about half an hour of keeping the whales cool, the audience is invited to start rocking the whales and help them to return to the waters. What is obviously missing here is the fact that in this environment, unlike their debut in Wellington, there is no water! The grand finale, played out to the soaring bombastic finale of Free Willy’s theme song (it sounded remarkably like it anyhow) is accompanied by buckets of water being flung high into the sky making a spectacle certainly but not quite like what it would have been to see the whales back in their natural habitat. This is where a child’s suspension of belief is infinitely greater and far less cynical. And they really are the best audience members for this type of work. 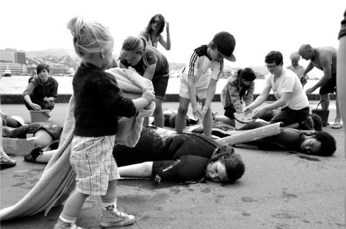 A very community orientated and participatory show, Whales might not quite have had the majesty or the magic that a marine environment would have offered but it nevertheless successfully gains the support of the local community. As far as my memory goes council would have had a great view from certain windows. I wonder what they thought of a pod of whales making themselves at home outside the Town Hall?